Colleges should do a better job differentiating ourselves in the materials we send, the presentations we give, and the websites we build. In an effort to be broad and aesthetically concise, we end up blurring all schools together. We want you to think, “Wow. I can see myself there” or “I’ll have friends and professors who will care about me,” so we stage diverse groups of students under trees with professors in front of our prettiest building on a perfectly sunny day. Now, you can attribute some of this to an overuse of the same marketing firm(s) within higher education. “Check out the 2018 template. In this one we moved the football team winning a pivotal game to page two, and decided to get a drone shot of the steeple clock tower at sunset from the east. Don’t like that? Okay, how about the one with the study abroad picture on the cover and the ultimate Frisbee shot as a centerfold?” Maybe we need StitchFix to start creating college brochures. Give me a little more Atlanta and dial back the political activism–that’s really more us. Our attempts to be inspirational or aspirational wind up being synthesized into three or four word taglines, such as “Change Your World,” “Dream Big-Live Bigger,” or “Create the Future.” (Rumor is “Drain the Swamp” started with a consulting firm working for a college, but currently that’s been dismissed as fake news.) 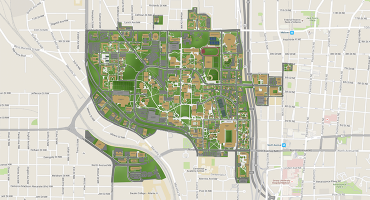 These attempts are ultimately why, based solely on brochures or websites, you might struggle to see a consequential difference between a small, private college in the middle of Ohio and a flagship public university in the Pacific Northwest. Our bad! Truth be told, we do the same on tours too. We find the most involved students and best ambassadors to talk about all of the amazing research they’ve done, trips they’ve taken, and jobs they have lined up. While telling their story, they work in equally impressive anecdotes about friends or roommates studying abroad or creating companies– all the while somehow impervious to the 90 degree heat. I’ve taken several tours this summer on my travels (registering under either George P. Burdell or Navin R. Johnson), so I’m not speaking only for Tech, or conjecturing about what may be happening. This is real, people. These students are amazing- and they’re actual humans- not prototypes or conglomerates of a variety of top students. Not sure about you but I’ve walked away from some of those tours with an even mixture of being impressed and depressed. So, unquestionably, it is our bad. We set you up. We skim over lots of details. We give you very generic information online and in brochures, and then expose you to our best- whether its buildings, students, professors, or alumni. It’s the equivalent of us lazily passing the ball toward you. What are you going to do with it? Well, like any receiver (regardless of the sport) knows, you can’t sit and wait for it, because it will either get intercepted or you’re going to get hit upon arrival. 1- Read and Research: Pick up an alumni magazine while you are on campus (tip: they’re always available at the college’s alumni building and most are readily available online too). What are they touting? Where are alums living and working? Inevitably, there are stories of professors, researchers, students, and even messages from the president or other influencers you won’t find in admission publications. 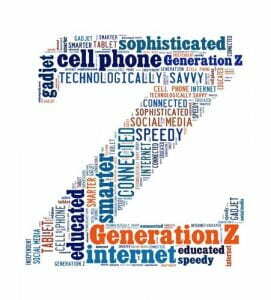 Grab a school newspaper, look online for social media that’s not generated by admission, i.e. the academic department or clubs you are interested in joining. These posts are always more organic and less polished, which is a good thing. 2- Walk and Talk: If you visit a college with a friend or parent, try to split up and take different tours. Even though, theoretically, it’s the same route and basic script, the voices and perspectives will always vary. It’s incredible how many times a tour guide’s personality, choice of footwear, the day’s weather, or some off-handed comment will influence your impression of the university. I challenge you to not let any one voice be too powerful in this process. You don’t read only one review on Yelp or Amazon, right? After the tour, go stand in the longest coffee line you can find on campus. Those are the conversations you need and want to hear. Sit down, compare notes, pretend to read, and enjoy the variety of discussions. 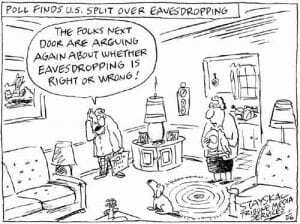 Eavesdropping gets a bad rap. It’s a life skill. In the near future, colleges will all have virtual or augmented reality tour options. You’ll be able to choose your tour guide avatar, customized tour route, and set your voice narration style. Imagine having Thomas Jefferson take you around UVA or Mark Zuckerberg take you around Harvard. Not “throwing shade” here—as I told you, eavesdropping was a life skill. It’s on you to limit your bias by soliciting as many opinions as possible. 3- Ask and Task: We’ve covered this before, but it bears repeating: It’s on you to ask good, probing questions. Don’t let the admission counselor pull the string in the back of their belt and start droning on about getting seven friends, a snitch and sponsor to start the Quidditch club. Dig deeper. They’re not being nefarious—but they are being lazy. Get beyond the first layer spiel. Stop the tour guide, pause the presenter. Ask them to delve into some detail about their student: faculty ratio or the availability of campus housing after sophomore year, or the percentage of undergrads actually doing research. brb. Well, next week anyway. As the mom of small children, I find myself constantly asking my girls one thing: wait. And please, be patient. Turns out young kids have a hard time with waiting. And who can blame them? Our world is driven by “right now.” If my 6-year old has a question and I don’t know the answer, she simply picks up my phone and Googles it (see conversation above). No waiting, no looking it up in a book. If she wants to watch a TV show she has Netflix (and the Disney Jr. app)… when i was a kid you had one shot at watching cartoons: Saturday morning. If you missed your favorite show, too bad—you had to wait a week to see it. All of us, as young as 1, and as old as, well, 30-something, could do a bit better with waiting. There will always be something to wait for in life. When you’re in preschool, you wait for kindergarten. When you’re in middle school, you wait for high school. When you’re in high school, you wait for college. When you’re in college, you wait to graduate and get a job. When you get a job, you wait to find the right person to marry… house to purchase… you see where I’m going here. The list goes on and on. Regardless of what stage of life you find yourself in, you will always be waiting for… something. If you’re a rising senior, you’re likely waiting for August 1 when many applications (including the Common App and Coalition App) open up. Once that happens, you’ll find yourself in motion as you work on your application and line up all of the documents you need and so on. Hopefully you’ll find yourself all done with your application long before the actual application deadline (hint, hint). At that point all you have to do is wait… and the question becomes: how do you wait? And moreover—how do you wait well? Once you hit that magical submit button, there’s still tasks to be completed. Your list of action items will likely vary from college to college. Follow up with your school counselor to be sure he or she knows what you need from them (transcripts to be sent, recommendation letters uploaded, etc.). Your job is to follow up and provide what is asked of you (so keep an eye on that applicant portal/checklist where you can monitor your status!). But here’s the key: don’t follow up every. Single. Day. Don’t camp out outside anyone’s office, don’t make phone calls every day, and don’t send emails multiple times a day pushing for a response. Make the request, give it a couple of weeks, and…. wait. If you’re getting close to a deadline and still haven’t gotten a response, of course be sure to check back in. If you’ve done your part and asked for the info, and the other person assures you they’re doing their part and working on it, then the next thing to do is…. Wait. This one may seem contradictory after what I just said. But just because you’ve submitted your application and requested all of your additional information doesn’t mean you get to just sit around. While you wait be sure to stay in motion. Sitting around and worrying isn’t going to benefit anyone, especially you! If your recommendation letters are finished, write a thank you note to each person. Lead a project at school, help out a friend, spend time with your family, and of course keep studying and working hard in class. Be active, and grow where you’re planted. Right now, in this moment, actually BE where you are instead of worrying about where you will be. Easier said than done, but trust me, practicing that now will help keep your blood pressure down in the future. 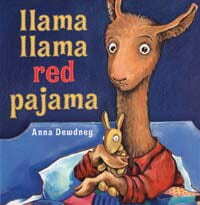 In the end, it’s okay to be a little bit like Little Llama. 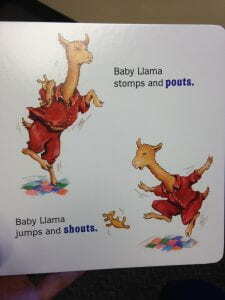 Sometimes it all becomes too much, and the only option left is to jump, pout, and shout. When that time comes, find your safe place and let it all out. That place could be with a parent, a friend, a teacher, or a coach. It may not be a person, but an activity that is your safe place (music, sports, horseback riding, hiking, etc.). Find a way to get all of the angst, anxiety, and worry out of your system, without judgement. Take a deep breath—actually, take a lot of them. It helps more than you might think. Remember that if you’ve followed the two steps above, then you’ve done all you can do. It’s out of your hands now… and that’s okay. If you’re like most students, you’ve done your share of waiting this summer. As you head into your senior year you’ll move from waiting-mode into action-mode. But after all the hustle, and the busyness, of a new school year passes, you’ll find yourself back in waiting mode. And I encourage you: find your way to wait well. 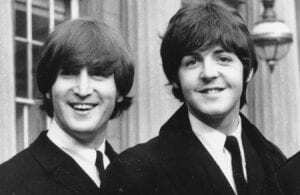 Those famed lyrics would never have been penned had John Lennon and Paul McCartney not met in Liverpool, England 60 years ago last week on July 6. And from the moment they joined forces until now, The Beatles have never gone out of style. If you caught any news last Thursday, you likely heard this story. 60 years! Yes, that is a long time, but it’s also a fairly random number. We don’t celebrate many things at 60. 25, 50, 100, sure. But only the things that really, really matter are celebrated at 60. And the fateful meeting of these two teenagers is something worth celebrating, because together they helped change the course of modern music. Paul hung around that day to listen. And later, when he had a chance to show off his chops on the guitar, he played several brand new rock n’ roll songs from the US, including Eddie Cochran’s ‘Twenty-Flight Rock.’ Unlike John, he not only knew all the lyrics, but also nailed all of the chords to this difficult tune. Later that night he also demonstrated great skill on the piano. 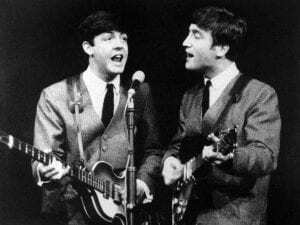 Here is where it gets interesting: John, who was the lead vocalist and leader of the group, initially debated whether or not to invite Paul to join the band, because McCartney was such a strong musician. But ultimately he took the risk of sharing the stage with someone so talented, and the rest, as they say, is history. 1. Like John, you need to open up. There is ALWAYS going to be someone better than you. Someone faster, smarter, more talented, better looking, more innovative or more capable. If you have not already experienced that, you are either an extremely big fish in a small pond, fatally flawed in your self-perception, or hanging around the wrong people. When you get to college the number in that next-level category grows infinitely. I sincerely hope that instead of being unsettled or intimidated, you will proactively seek them out. Surround yourself with them, study with them, hang out with them, or invite them to grab a meal or go on a road trip. John Lennon had panache. He was talented and confident. He was a leader. But his Quarry Men band mates all played second fiddle (actually second guitar, but you get my point). Had he stuck with that crew, he may never have left the Liverpool circuit. Ultimately, what made him great was putting an infinitely more gifted musician on stage with him so his gifts of improvisation, creativity, and flare could be fully realized. 2. Like Paul you need to show up. Without Paul’s curiosity, desire to hear great music, and proactive ask to be included, the meeting– and the Beatles—would have never happened. He stuck around. By all accounts, John was somewhat intimidating. And he was a year older than McCartney, which at 15 and 16 can be a big deal. But he believed in himself enough to try to work his way in. He could have just listened and left, but he recognized an opportunity. So he picked a really tough, brand new song that had not been fully released in the UK and then demonstrated his skill on two totally different instruments. He essentially asked to be included then showed why he should be. One of the biggest mistakes smart students make in their freshman year is not asking for help. Most come to Tech, and schools like us, having never needed to. They were the ones tutoring others in high school. They were the ones friends, neighbors, classmates came to for help. They were, if you will, the lead guitarist. I am not a big fan of the college rankings, because I think too many people use them to initially create their college lists or lean too heavily on them when ultimately choosing a school. Many will insist there is a consequential difference between number 11 and number 19. Based on experience and rankings methodology, I would vehemently contest that opinion. However, one thing you can be assured is identical between them– they are going to challenge you academically. You will be stretched and pushed due to the rigor of the course load, your inherent desire to do well, and the quality of professors you meet. Ask for it early. Ask for it often. Even if you see or visit the tutoring centers on your orientation tour this summer, go back in the first week and introduce yourself to the people who work there. Once you get your schedule, hold time each week to study and put the location down as their office. Bookmark their website, make their homepage your mouse pad. You get my point. No matter where you are going to school, there are going to be other students in your residence hall, classes, labs, sororities, clubs, and teams who can help your creativity and other talents come to life. They can help lift your proverbial voice. But like John, you need to open yourself up to those relationships. Like Paul, you need to show up and embrace their complementary talents, so they can sharpen you– and vice versa. The real tragedy, whether it be in sports, academics, music, business, clubs, community or any other venture, is when you shut down or close off due to a lack the humility or willingness to risk not looking like THE absolute best, because the truth is that only assures you of never becoming YOUR absolute best.